First thing in the morning, an Idealrain shower can become your wake up call; transforming your bathroom into a place of invigoration. Idealrain inspires and re-energises you. It puts you in the right frame of mind to make the most of the busy day ahead, so you can step out of the refreshing rain and into your world. After a busy day, your bathroom can be a refuge of relaxation and warmth. An Idealrain shower invites you to stand beneath warming rain, eyes closed, face turned upwards, and let the sensation of rainfall wash away the stresses of the day. Idealrain helps you relax, unwind and escape. You can indulge yourself in a rain shower that you control to suit your mood. A long, hot shower gives you a deeply relaxing soaking. Lighter rainfall can revive the spirits, whilst a stronger stream gives you the feeling of reaching deep into your tired muscles and massaging them gently back to life. Idealrain lets you shower in the way that suits your mood. So you decide whether to stand in a hot, relaxing downpour, be refreshed by a fine, tropical mist or experience a full, monsoon massage. Different shower settings can be determined with a single touch of the ergonomically-designed, spray pattern selector. You choose whether to feel refreshed and ready to start your morning, or completely relaxed at the end of a day. 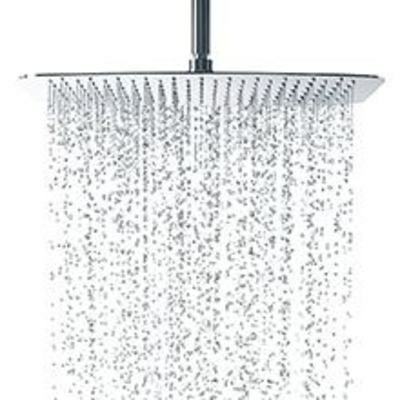 Idealrain features large shower heads, convex faceplates, 10 degree angles and nozzles right to the edge of the spray plate. 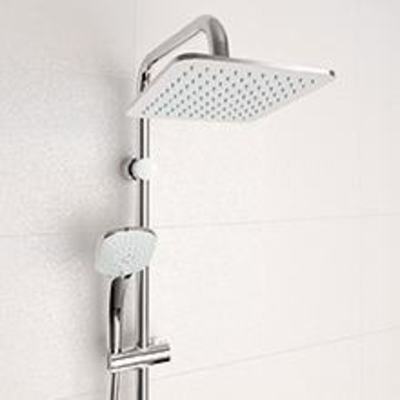 This ensures a wide rain effect, soaking you more thoroughly for greater showering pleasure. Water is one of our most precious resources. 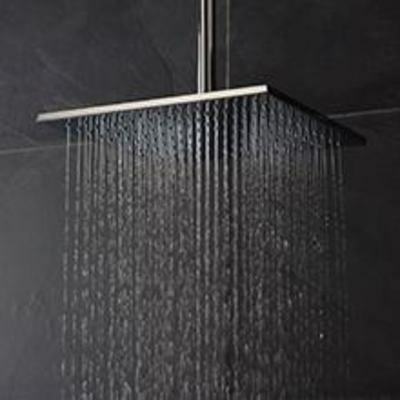 Idealrain is cleverly designed and precision manufactured to help you reduce water consumption without compromising on comfort, enjoyment or reliability. Intelligent water flow: Idealrain‘s precision-designed flow engine delivers optimal spray performance. The additional, easily fitted and removed flow restrictor, reduces water consumption in high-pressure systems from 18.5 l to just 8 l with no loss of flow. Whether you want a simple shower kit or an all-in-one shower system, Idealrain Cube works. All Idealrain Cube handsprays and head showers are compatible with Ideal Standard thermostats, sliding bars and other Ideal Standard collections. So your shower can follow the geometry and the purity of your overall bathroom design. We’ve designed and built Idealrain Pro to be ultra durable, and extremely economical in use. Perfect for professional settings; like hotels, public washrooms, civic amenities, airports… The handspray’s slim lines contrast with its strength and reliability. The elegant wall mountings are actually heavy duty fixings. 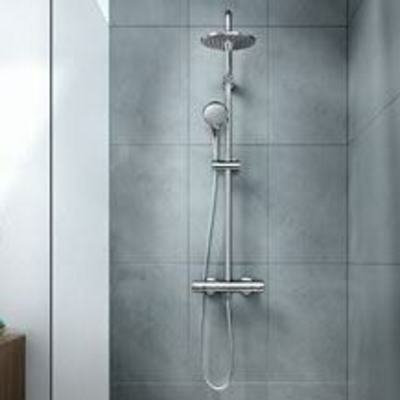 The shower’s performance is outstanding and its looks are long lasting.